Delfeayo Marsalis is the trombone-playing younger brother of Branford and Wynton. If his name isn't as familiar, it's because Delfeayo has spent the first eight years of his professional career establishing himself as a powerhouse jazz producer. But with a new album out, Delfeayo again lays claim to a family heritage of outstanding instrumentalism, a heritage he first staked his claim to in 1989 when he helped the Berklee College of Music to the national college jazz band championship. His playing style is closer to that of Wynton's. 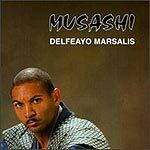 While Branford, the eldest of pianist Ellis Marsalis' clan, has established himself as a listener-friendly saxophonist as at home in the world of pop as jazz, as a performer Delfeayo is following Wynton's example in playing challenging straight-ahead jazz that confronts as much as it delights. The song roster on "Musashi" ranges from four originals to covers of "Angel Eyes," "Too Marvelous for Words," "Summertime" and "Only the Lonely." Marsalis' quintet includes fellow Berklee grads drummer Masahiko Osaka and saxophonist Mark Gross. It is filled out by pianist Yuichi Inoue and bassist Shigeo Aramaki. The young musicians  as all young jazzsters will  spend considerable time showing off their chops. But as the liner notes point out, Marsalis already has developed an individual style on slide trombone, and the rest of the combo is likewise mature and polished. The major strength of this album, though, is Marsalis' sense of purpose and direction: Throughout, there is a deeply permeated feeling of structure, of voice, that Marsalis and band are always in control, always channeling their talent into a greater artistic whole. Want to know how good it is? The above mentioned liner notes? They were written by legendary jazz writer Nat Hentoff, who retired from jazz writing some 20 years ago to concentrate on social justice issues. Just getting to read Hentoff write about the music again is reason enough to buy most any CD; but this one is as good an example of jazz performance as Hentoff's lyrical prose is an example of jazz writing.